Public school employment has grown at least three times faster than the increase in students, according to a new study released yesterday by The Friedman Foundation for Educational Choice. And the national increase is reflected locally, with employment outstripping enrollment in both Kansas and Missouri. 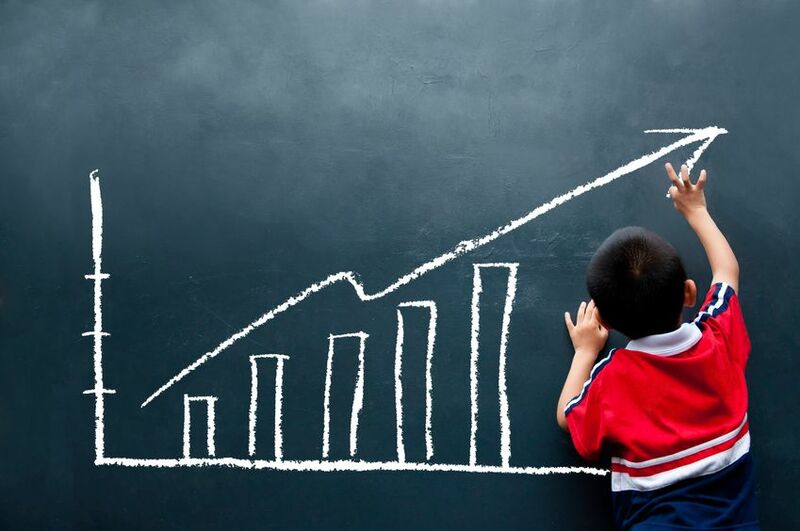 Although employment has been increasing, Scafidi contends the increase was not caused by the federal No Child Left Behind Act’s requirements intended to close achievement gaps among advantaged and disadvantaged students. Also, Scafidi contends that staffing increases have not led to improved student learning. 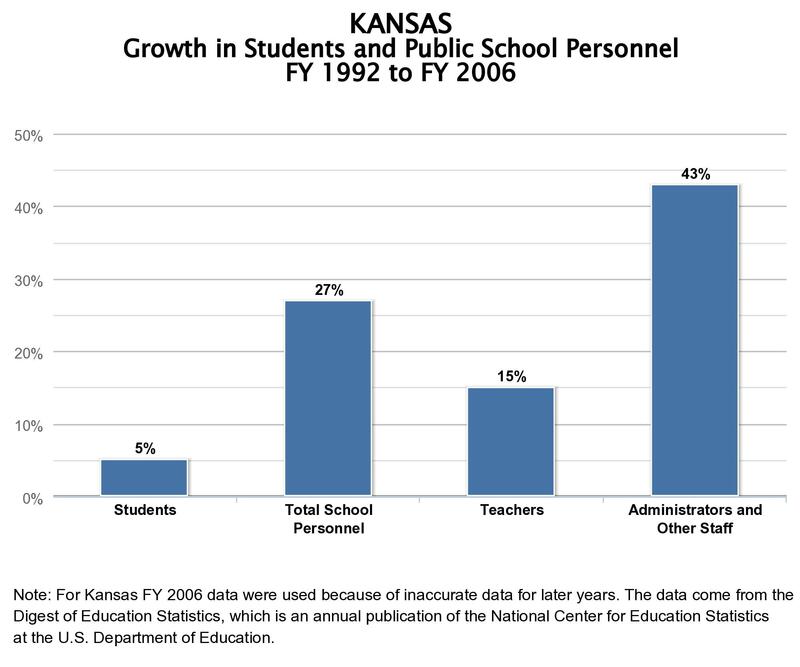 In Kansas, enrollment increased by 5 percent over the 20-year period examined in the study. By contrast, the number of total school personnel increased by almost 30 percent. And most of that increase — more than 40 percent — was caused by adding more administrators and other non-teaching staff members. Teacher employment increased only by 15 percent. Illustration Credit: “The School Staffing Surge: Decades of Employment Growth in America’s Public Schools” by Benjamin Scafidi, Ph.D., published Wednesday, Oct. 24, by The Friedman Foundation for Educational Choice. 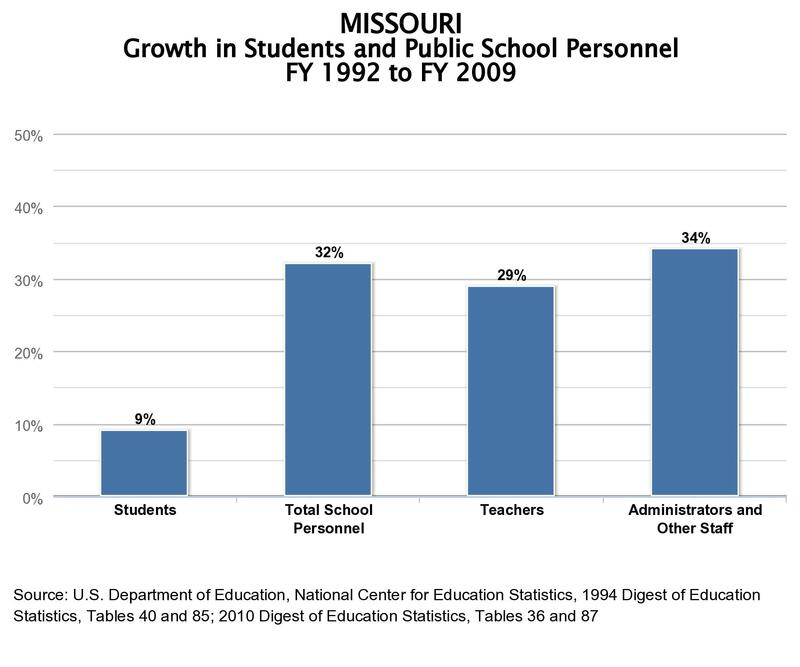 In Missouri, enrollment increased by almost 10 percent and employment by a little more than 30 percent. The number of administrators and other non-teaching staff increased by almost 35 percent and the number of teachers by almost 30 percent. Nobel Prize laureate Milton Friedman — who specializes in studying free markets — established the foundation that bears his name. The report they released this week is titled The School Staffing Surge: Decades of Employment Growth in America’s Public Schools.